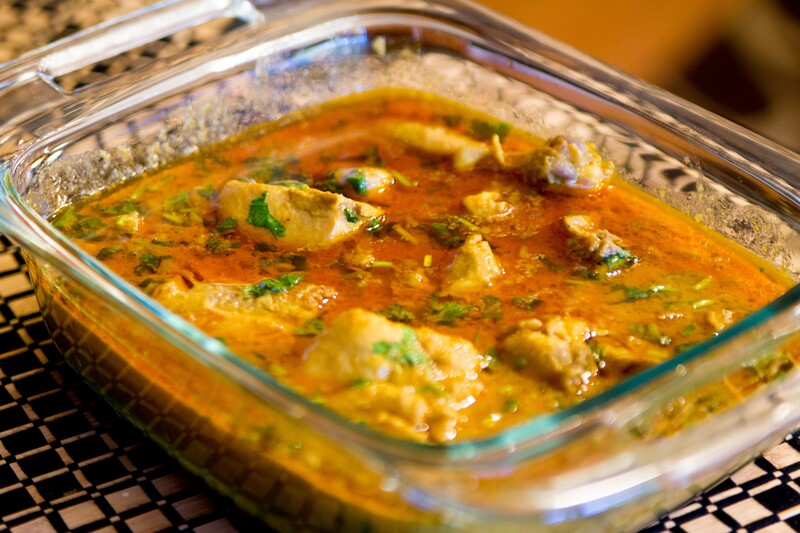 This is a delicious and easy chicken curry recipe. Add onion and corn oil to frying pan. Fry for about 5-8 minutes on high heat until the onions become soft. Filter out corn oil from onions and add onions to a blender. Add garlic cloves and ginger. Liquefy. Add chicken to the frying pan. Fry for about 2-5 minutes until it turns a whitish color. Add the blended onions and garlic cloves first. Add the following: turmeric powder, red chili powder, coriander powder, black pepper, and salt. Cook on low heat for 10 minutes to avoid burning spices. Stir occasionally. Turn up heat one to two notches depending on your stove in order to evaporate excess water from the chicken. Cook for about 35-40 minutes. Stir occasionally. The chicken should start to separate from the bones by the end of this step. Once water evaporates, fats and oil should rise to the top. Add 1 ¼ cups of water for the curry sauce. You can add more or less as per your taste. Cook for another 3-5 minutes on medium heat with the lid on until the water boils. Top off with cilantro. Serve with Indian bread.